I can only imagine how exciting it must have been for my mom when she moved to Europe after marrying my dad (he had been her french tour-guide...how romantic is that?). Luckily, my dad was the cook in the family, because just like her daughter, my mom isn't the best when it comes to conversions. :) When she did cook and bake, she used a non-digital, almost-impossible-to-read contraption. The very same one that I used for this shortbread. And despite my vintage second-guessing and worry over precision, the results were perfect! 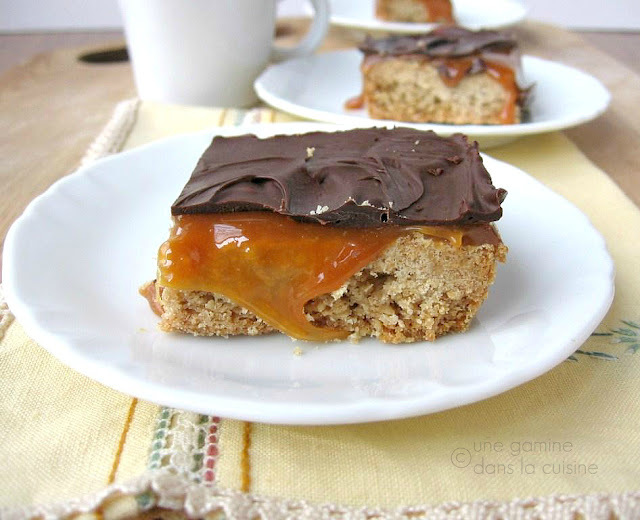 What I love about this recipe, aside from the salty caramel, is the rich texture and flavour of the shortbread crust. I was worried that the oatmeal would soak the life out of all the butter and brown sugar, but it actually adds a lot of depth and makes the bars more "hearty." The walnuts performed beautifully, as usual. They offer just the right amount of warmth and subtle bittersweet aftertaste that one can only find in walnuts. And the caramel sauce...what can I say about the caramel sauce? It's salty, it's sweet, and it's buttery. Is that enough? 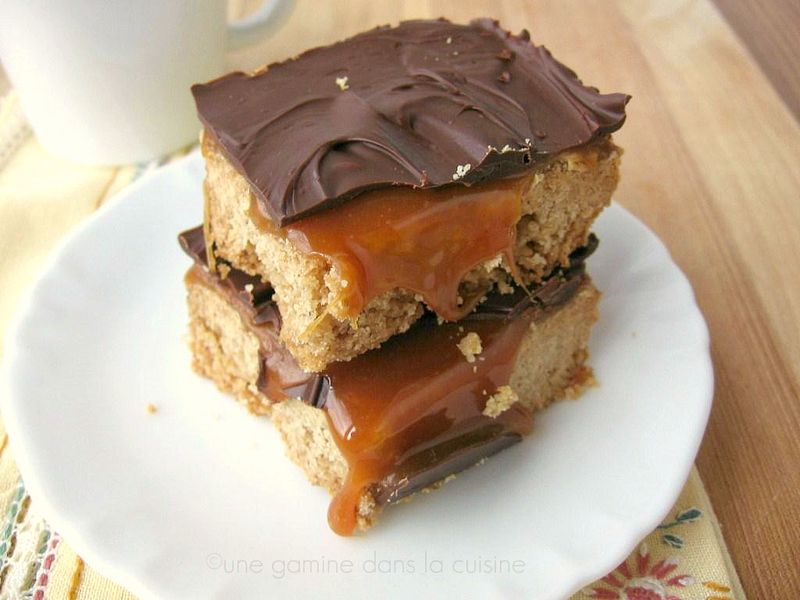 Sitting on top of the divine caramel is a thin layer of melted dark chocolate. The only problem that I had, if you even want to call it a problem, was runny caramel. As soon as I sliced into the shortbread, my caramel sauce oozed out, everywhere, like a sweet pyroclastic flow. Note: If you don't have a scale that measures in grams, allrecipes has a helpful chart. You may need to guesstimate on a few ingredients, but since the recipe is pretty straightforward, it shouldn't matter too much if your measurements are slightly off. Prepare the caramel sauce: In a large, heavy-bottomed saucepan, melt the sugar over medium-low heat. Once the sugar has melted, Do Not stir (stirring will cause the sugar to crystallize). Instead, use the handle to gently swirl the pan around occasionally (to prevent the sugar from burning). Cook the sugar until it becomes caramel-colored. Once it reaches desired colour, turn the heat down to low and whisk in the pieces of butter until melted. While whisking, slowly add the cream in a steady stream. (The caramel will sputter and bubble, so be careful not to burn yourself.) Keep whisking until the caramel smooths out again (this may take several minutes). Cover and set the caramel aside to cool off while you prepare the crust. Do not refrigerate. Prepare the crust: Preheat the oven to 350 F. (160 C.). Lightly butter a foil-lined 9x9-inch square pan. Set aside. Prepare the crust: Place the flour, oats, walnuts, brown sugar and salt into the bowl of a food processor. Pulse/process until everything is more or less evenly ground. Toss in the chilled cubes of butter and pulse just until the dough starts to come together. (Try not to over-process...you don't want the dough to cling to the blade.) Press dough onto the bottom of prepared pan. Bake for 35-40 minutes, or until the top turns light golden. Cool completely on a wire rack. Once the crust is cool, pour on the caramel sauce. If the sauce has thickened or hardened, place it in the microwave for about 10 seconds...just long enough to make it spreadable. Using the back of a spoon or a small off-set spatula, gently guide the caramel over the crust, until it's evenly covered. Cover loosely (don't have the cover touching the sticky caramel) and refrigerate for at least 2 hours. Topping: Using a double boiler, or the microwave, melt the chocolate, stirring occasionally, until smooth. Pour the melted chocolate over the now-set caramel. Spread into an even layer. Return the pan to the refrigerator and chill for an hour. That version is terrific! 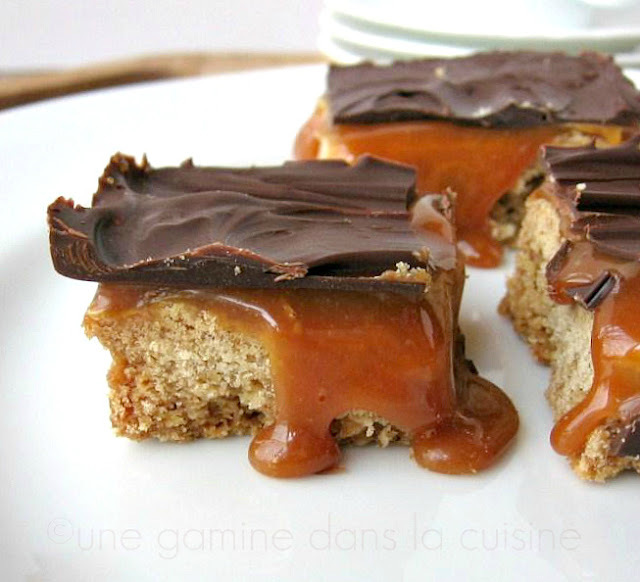 Your bars just look devilishly scrummy with all that gooey caramel oozing out. The 'mistake' gooey caramel turns out to be the star element---I love it. This looks well worth hauling out my gram scale for! I love recipes in grams! That dark chocolate and oozing caramel looks amazing and reminds me that I haven't posted the homemade Turtles or anything else I've made. Sweet dreams of these squares should get me motivated! Your photos are always so gorgeous. These look absolutely delicious. I love the twist on shortbread! That is one of the most delicious-looking things I have EVER seen. I need to make that, pronto! These have all of the flavours I love and cannot wait to have some of the gooey caramel.